Traditional Arctic cultures saw the world as a place filled with spirits and mysterious forces. Anyone could attempt to use these forces, usually with the assistance of individual spirit helpers. Certain individuals, however, developed their ability to attract and hold powerful spirit help, and had the power to harness or control these forces on behalf of their community. We know these skilled and powerful religious practitioners by the Siberian term "shaman." Some were selected at an early age, and trained or apprenticed by an elder shaman. Others were selected by the spirits, usually through recovery from a dangerous and debilitating illness, or perhaps because of a physical or mental abnormality. Still others were self-selected, on the basis of a forceful personality and the development of spiritual abilities. Shamans could travel to other mysterious planes to contact and influence the world of spirits. They could see events that occurred far beyond the physical horizon, events that took place among the animals and spirit people of the sky world and the underworld, or events that had not yet happened. With the aid of their spirit helpers, they could calm a storm, cure an inexplicable illness, or attract a herd of animals into the range of the community's hunters. The shaman was the doctor, priest and seer of the small communities of Dorset hunters scattered across the Arctic world. Many of the carvings made by Dorset artists seem to have been used in religious practices, and may have been the instruments of shamans. The objects exhibited in this room may have been used by shamans in visiting and manipulating the world of the spirits. These objects include two wooden frames of small drums. For all shamanistic peoples, the drum was the "shaman's steed" or "the door to the world of the spirits." In the midst of the small gathered community, the shaman used the hypnotic beat of the drum to induce the trance-like state in which journeys to the spirit world were undertaken. One of these tiny drums has been reconstructed, and its sound is used in the Dreams and Visions simulation of a shamanic journey. 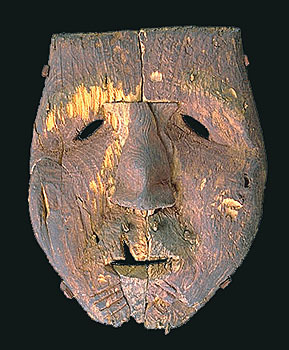 Two life-sized masks were found in association with the drum frames. Carved from driftwood, painted with red ochre and enlivened with incised tattoo lines, they originally had fur eyebrows and moustaches attached with pegs. Such masks come in two forms, the main distinction being the slant of the eyes: on some masks the thin oval eyes slant upwards, away from the nose, while in others they droop downwards to give the face a distinctly sad appearance. The same pair of faces is found in other Dorset specimens, suggesting that they represent two important mythological personages, or perhaps that one face is male and the other female. 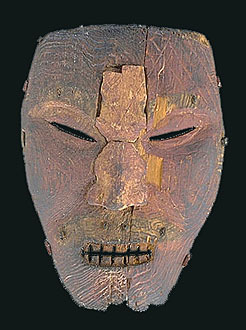 Masks were likely worn during ceremonial or ritual activities, probably by shamans engaged in contacting their spirit helpers. The mask may have transformed the shaman into a spirit, or at least represented such a transformation. Other transformations are probably represented by carved sets of ivory animal teeth, with long projecting canines like those of a bear or a wolf. These have been designed to be placed in the front of the mouth, where they can be gripped by the teeth and give a very effective impression of a human face becoming that of an animal. Carved representations of spirit helpers, usually with the creature's skeleton visible on the surface, were probably part of a shaman's equipment. 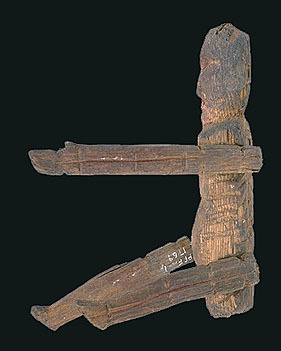 Puppet-like human figures carved from driftwood, with detachable arms and legs, may have been used in some form of fertility magic. 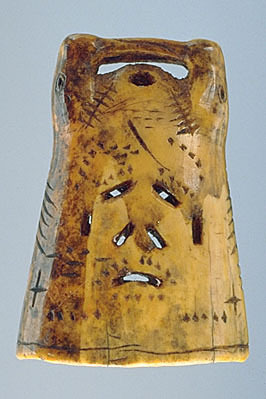 Small tubes ornamented with a complex skeletal motif, and with one end carved with wolf and caribou heads, may have been sucking tubes through which a shamanic physician removed illness from the body of a patient. Miniature harpoon heads may have been the magical weapons the shaman used to demonstrate that he had successfully removed the cause of illness. Cylindrical boxes carved from bone or antler may have been the utensil cases in which small and powerful spirit representations were contained. Antler wands, covered with representations of human or human-like faces, have been recovered from a number of Dorset sites. Some of the faces seem to represent rather ordinary humans, while others are distinctly bizarre: long faces with narrow and elegant noses; broad and squat faces with grimacing mouths; faces with the lips rounded and pursed as if blowing their breath at the observer; faces with animal muzzles; and others with wide-open screaming mouths and protruding tongues. We can only guess at the interpretation of these crowds of tiny faces. They may be cartoon-like representations of the people who lived in a local community or the images of a Dorset pantheon of spirit beings, or perhaps the spirit helpers controlled by the individual shamans who owned and used these artifacts. One of the more spectacular examples is heavily worn around an area that fits into the hand; it must have been carried by hand over a long period of time. Side 1 The featured artifact in this room is a small bell-shaped tube carved from ivory, one of several such objects that we do not understand. 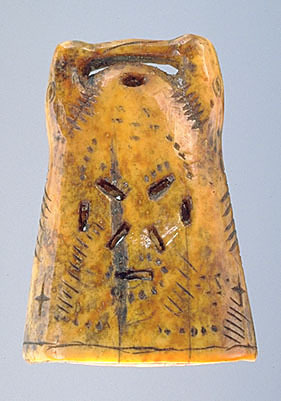 Most are designed in a very specific style: a pair of walrus oppose one another from either edge of the tube, with their tusks joining across the top, while human faces are carved on each of the flat sides. The combination of paired walrus with two human faces must have had a symbolic meaning within the Dorset system of beliefs and symbols, but that meaning eludes us, as does the function of these artifacts. They may have been used as containers for small items of magical equipment, or perhaps as rattles, which are widely associated with shamanistic practices. Whatever their use, they were made throughout the Dorset world for a period of almost 2,000 years.